We offer a variety of packages and products to suit your use of contact lenses; all of these are backed up by after-care that is tailored to suit your individual requirements. We can help you to choose from daily disposable lenses, those replaced on a monthly basis or more rigid lenses that can be worn for up to a year. We also provide cosmetic coloured lenses that can be worn with or without a prescription. If you require contact lenses we will offer you a separate examination to fit your lenses to the curvature of your eyes and for you to try wearing the lenses for a short period of time. 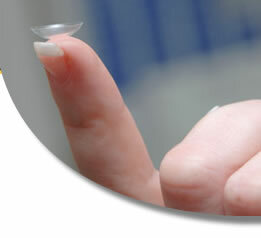 We can show you how to look after the lenses and then recommend a check at a certain period after your initial fitting. Regular checks are available after this.